I try not to lie that I’m a sucker for the Fate series. I mean, I got into a card game just because it had Fate on it. I gambled on buying a Figma (and got a bootleg) because I’m a fan. Hell, I marathon everything I can get my hands on of the series because I just find it that intriguing, yet I am not into it enough to have read/played everything released in Japan due to not having the time to sit and do the translations (or read a secondary translation while playing). 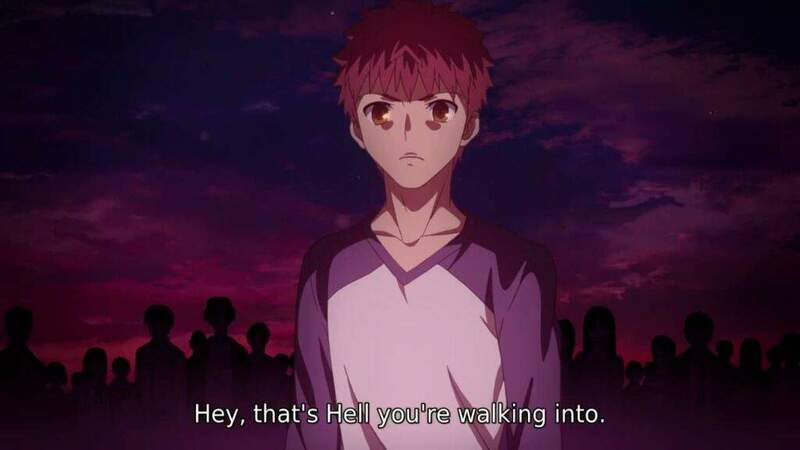 So it should not be a surprise to you that I got into the mobile game Fate/Grand Order when it was released in the US, and then proceed to drag my friends kicking and screaming into this salty abyss. Now that the game has been out for a bit, it’s time to talk about the madness. Brace yourselves, because you’re about to deal with my own Noble Phantasm: Unlimited Blog Works. Fate/Grand Order is an offshoot/continuation of the Fate series. It takes place in 2017 in an isolated base, with an organization that is tasked with ensuring that human civilization survives the next 100 years. Something goes horribly wrong, and you, as a “common recruit” are thrust into the situation as a Master of a new Demi-Servant, a human who made a deal with a Heroic Spirit. The game functions as a typical freemium game (gacha for random draws, slowly recovering energy for actions, premium currency to do special things and buy stuff) with RPG elements (Servants have classes, RPG-like skills/combat) and special events (maps, special loot, etc). The game inspired an anime film by the same name (coming to BluRay/DVD in October, available on online streaming outlets), and many of us are hoping to see more of it. As noted, it is a typical Freemium game. You wait for your energy to build up, you grind for in-game currencies, spend said currencies and materials to level up, and repeat. I do find there is more to this game, though. Like other Freemium RPGs, there is a story here, and it is advertised to be somewhere around a million words, but it also feels like a Visual Novel in it’s non-combat gameplay, which is a nod to the roots of the franchise (and the rest of the Nasuverse). Thankfully there’s more to the game than killing people. It uses characters from all of the Fate materials, including Prototype, Apocrypha (which recently got an anime), all of the Fate/Stay Night storylines, Extra, Extella, Zero, and many more storylines and offshoots. There’s also new-for-the-game characters that do not appear in a visual novel or anime, so there will be some new faces on top of the familiar ones. Salty, salty Hell, or a fan’s Waifu/Husbando Heaven? First off, it’s Fate. That already gives it points in my book. Yes, I’m a bit biased, but I love the series too much to not give anything with it’s branding a fair go. As I mentioned before, it does play a bit like a Visual Novel, as you are given walls of text with character conversation (with an image of that character that does change based on emotions felt, including blushing to angry) and options to pick. While the options don’t seem to change much of anything beyond the art of the character you see or the dialog, it is an amusing thing to add (especially when you choose something just to get a laugh out of things). I’m honestly in love with the combat mechanic in the game. While there’s a certain degree of Rock-Paper-Scissors with regards to weaknesses among the Servant classes (Saber beats Lancer which beats Archer which beats Saber, for example), it works out and balances pretty well with all of the different classes. In fact, we see a return of the classic seven (Saber, Archer, Lancer, Caster, Rider, Assassin, Berserker), a nod to other parts of the Nasuverse/Fate series (Alter Ego, Avenger, Beast, and Ruler), and a new class (Shielder). In addition to the Rock-Paper-Scissors element, the game handles actions by Cards. There are three cards with different effects, and combining them allows for a certain degree of effect combination or enhancement; Buster is a heavy attack that raises attack, Quick is a way to gain Critical Stars and hit multiple times, and Arts raises your NP gauge (and often hits multiple times). Each character has five cards assigned to them based on their strengths (so a fast Assassin would have three Quick cards, while a Berserker would have Buster cards), and all fifteen available cards (five for each Servant) are “shuffled” and dealt each turn for actions. I rather like this as it adds a certain random element to combat. The artwork and animations are great for a mobile game, but I expected nothing less here. The sprites are nicely done, the character cards are lovely (and there’s multiple cards and sprites for each character as you ascend), and the backgrounds are lovely. I should also add that they kept the original Japanese voice actors for many characters that were in the anime, and have some other big-named voices in as well (like Takehito Koyasu, Saito Chiwa, and Sakamoto Maaya to name a few). This made my day, honestly. While I’m loving the game, it does have a number of faults that I am hoping are addressed in the future (if possible) and want to warn potential new players about. First, the game is truly a Freemium game, banking on players paying real money to get in-game currency. Like most games of it’s type, it relies on a random number generator in the form of a gacha (short for gashapon; a vending machine for random prizes), meaning if you want a particular character, you really need to be lucky to get who you want or you’ll be paying out the nose to get that character eventually. I don’t care how “cute” the characters are, if the drop rates are terrible, they’re terrible. Which brings up the second point: the premium currency is rather expensive. Many other gacha-based games have currencies that are a bit pricey, and this is no exception. If I want to do a 10x summon (which ensures at least one “Card,” meaning Servant or item, is 4* or better), I need 30 Quartz, which is going to run me about $24 for each of these 10x summons, and there’s no guarantee that I’ll get who or what I want/need. Honestly, I’d much rather pay to ensure I get a specific character than rely on the random rolls, but that’s just my opinion (and something I do wish these games would do more often). It really doesn’t help that my ability of drawing the card I want in a Gacha is always slim, even during events. For example, I dropped 26 total summons on the Gilgamesh summon event, and got ONE 4* Servant (and one 5* Craft Essence, which is a booster). Not sure if it’s just my luck or general gacha madness, but still; not good for people like me, apparently. Third, the game really is a “waifu” game. The sole purpose of most people playing it is to get their favorite characters and go. This isn’t necessarily bad, but it does come out quite often (and becomes frustrating when the one character you want is such a low percentage). Fourth, the game feels, at times, like an unnecessary grind. As previously stated, the game has RPG elements, so leveling up is a part of this. Sadly, finishing quests doesn’t give your characters much XP, so you are relying on farming for XP via daily quests in order to get XP for your characters. Then, if you max their level, you need to dump even more into the character by finding all of the materials needed for Ascension, which will require luck and quite a bit of farming. To add insult to injury, some characters take forever to even find their materials (requiring you to complete multiple maps to find the items), so you could have a capped character that quickly becomes useless because their materials are not available yet. This also becomes exacerbated by the need to level up character skills as well, which also require materials, some of which are used for ascension. I’ve been revisiting maps often for premium currency and other items. Then there’s raising the character’s Noble Phantasm. Think of it as a cross of their trademark, finishing blow, and Limit Break. These start at level one, max at level five, and can only be raised by acquiring additional copies of that same character. In the end, to level up your character to the maximum (and therefore unlocking new appearances, skills, capabilities, and interactive moments), you need to farm XP cards, specific ascension items, skill ascension items, and four additional copies of that same character. With 5* Servant cards having only a 1% chance to drop, and the pool getting progressively larger as you play the game (with a new Servant or two being permanently added to your pool after each chapter, as well as more Servants added as the game expands), your chances of getting a maxed out Servant of your choice is going to become an expensive and time consuming endeavor. While you can technically beat the game without high-tier characters, it is exceedingly difficult to do so. I hit a few fights early on in the game that I could not beat due to my characters hitting a level cap. In fact, I have a few parts of my map that recommend level 60, but my best characters are at level 50…and I am struggling to farm the materials needed to ascend them again. My fifth point is a bit nitpicky, but I’m not the only one facing it: I wish there was a way to go “back” in combat. If you press the “Attack” button in combat, the game actually locks into the card page, and you cannot go back. Therefore, if you forget to heal, use an attack boost, or forgot any other ability, you are SOL. Finally, while I love the dialog, there are three elements that worry me. First, there’s issues with the translation. While many of these were advertised to be fixed, as I have already finished them, I cannot confirm if they have been fully remedied. I have found a few others since the update, and while it doesn’t ruin the game, it gets a bit awkward and does bother me as someone who does freelance editing. Minor errors, but they can get annoying. Second, there’s a LOT of text. This isn’t necessarily a bad thing as it progresses the story, but it can be detrimental for those who don’t like reading, those who don’t want to wait to get back to the “action,” or for those who are on a time crunch (as I often am), and it is doubly frustrating with all of the typos that makes the editor in me cringe during most exposition moments. Third, there’s a few bits that don’t show up as they should. For example, on a normal loading screen, I’d see some sort of advice or information about a Servant, but sometimes I just get a random black screen with a few random words on it. Finally, there’s some rather “odd” bits of dialog that push the envelope just a bit further than I am comfortable with. For example, in one of the story arcs, a historic figure was summoned as an adolescent girl of maybe fourteen (when said figure died closer to age 40), and met her killer who was an opposing Servant. During their discussions, he speaks of hoping to have given her a climax upon her death, and wishes to do so again. The commentary is already rather creepy, but knowing that the killer Servant is a fully grown man (and is fully grown in this form) speaking to a young teenager just ups the squick factor for me by quite a bit. While not bad for the game itself, the one gripe I do have is that this isn’t a full-blown RPG. I would pay good money to have this as a standalone RPG with a different travel/wandering mechanic in exchange for the AP system (or a different Mana/Stamina system for abilities). Just my opinion, of course, but damn, the franchise has the potential for a great game. At this time, I think Fate/Grand Order deserves 3.5 Buns. It’s a Freemium game using a Gacha that has a story, a blend of Visual Novel/RPG elements, nice artwork, and it’s totally a waifu collection game. I swear, people have been fighting over her as her stats are solid. While the game has faults, the team behind it are already working toward remedying it. I’m not sure if it’ll fix everything (as some of my problems are within the Freemium elements, like the poor draw rates), but there’s plenty of potential here that makes the game worth downloading. Fate/Grand Order is available for Apple and Android phones via their respective app stores. The game is free but offers in-app transactions. And if you want to add me; feel free!